... just needs cosmetics and a little bit of transmission work. Do you know what exactly it needs? Layshaft bearing maybe? Not 100% sure yet. Dad says it pops out of first sometimes. Probably worn selector fork and dogs. No biggie. Shift fork is what I was thinking too. I picked up a clymers manual and have just begun looking over the transmission stuff. Complete set of alloy bodywork for a Norton Commando that I sold to a guy. It's now polished and going on the bike. I get it, Thanks. I'd say though you are the one who is still in luck. My Dad has been a motorhead his whole life but now he can't ride regular motorcycles, let alone a kick only Commando. It's been pretty tough on him. I've ridden with him since I was 6 and it's hard to see him have to give it up. At least he does have a hopped up little Korean two stroke scooter he can get to the coffee shop on. That is Commando glory right there. I don't even want to ask what that setup is worth. I don't even want to ask what that setup is worth. 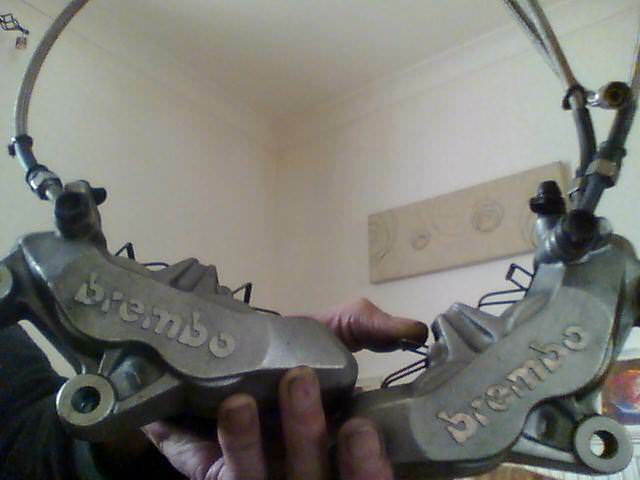 Brembo calipers...I only need the leftside, but two for the price of one can't be bad?